We just learned about the Daughters of Charity of Saint Vincent in France. One of the oldest known Nuns was Scholastica, who was the twin sister of the monk Benedict of Nursia that we learned about before. She lived the eremitic or "hermit" life, living by herself but in an area where there were other women also living alone so sometimes they could meet up and talk about God. Sometimes she would meet up with her brother Benedict and they would share the wisdom that each of them had learned. She is said to be the first woman to set up a Benedictine convent, where other Nuns could meet up for worship. We just learned about the Jane Browne Memorial by John Flaxman in England. Another Neoclassical sculptor is Rudolph Schadow, the son of Johann Gottfried Schadow that we learned about before, that made the statue of the two princesses. Rudolph learned from his father, and one of his most famous sculptures was of a Spinning Girl made in Rome around 1810. We just learned about the alphabet in Greek. We just learned about the Submarine Earthquake that happens underwater. Another type of quake is a Supershear Earthquake. A lot of earthquakes happen with the earth moving side to side, like a slinky squishing and then stretching. Some earthquakes happen like a slinky but you lift it up and the pull it down, causing a wave to go through it. When this wave is very fast and strong, it can rip through the ground with a lot of force, and cause a lot of damage. This is a supershear earthquake. We just learned a little about frog eggs, called Frogspawn. When the eggs hatch, they turn into Tadpoles or pollywogs. They are born with little flat tails, gills for breathing, and cartilage for bones. As they get older, they will start to grow tiny lungs that they can use along with their gills to breathe. Tadpoles mostly eat algae, but some bigger ones will eat insects or tiny fish. They are in danger of being eaten by fish, large insects and birds, so some tadpoles are poisonous to protect themselves. Eventually they will start to grow legs as they are on their way to becoming a frog. This could be as fast as a week, or as long as a year! We just learned about the Glenhumoral Ligaments in the shoulder. Another piece of connective tissue is the Humeroradial Ligaments. The upper arm bone is the humerus, and one of the bones in the forearm is the radius. So the humeroradial connects the humerus to the radius. Sometimes it is just called the RCL for radial collateral ligament. We just learned about the Mexico State of Coahuila. Another Mexico State is Hidalgo. It is one of the smaller states, but has many famous things like ancient ruins, hot springs and mountains. Hidalgo is in the middle of Mexico, surrounded by other states. The coat of arms of Hidalgo shows green mountains for the natural beauty of the state. On the left is the Bell of Dolores, a famous bell used in the state's fight for independence. On the right is a red cap with laurel branches, for victory. The bottom has a round drum for the military battles they won. The holes in the ground are for the mining that makes a lot of money for the state. Tula is a famous city in Hidalgo, where there are ancient pyramids, buildings and statues going back over 2,000 years. The Basaltic Prisms of Santa María Regla are tall rocks with water running down them, and then turning into a waterfall. The tall rocks were made by cooling volcanic lava. In Huasca de Ocampo there is a large canyon made by the Hueyapan river. We just learned about the Desert Mothers who lived in the deserts and wrote wise sayings. Another group of women living as nuns is the Daughters of Charity of Saint Vincent de Paul. In the 1600s in France there were a lot of poor people needing help, but there was not a very good way to organize taking care of them. The Daughters of Charity set up soup kitchens, hospitals, schools and homes for orphans. We just learned about the sculpture of George Washington by Antonio Canova in 1820. Another famous sculpture is the Jane Browne Memorial made by John Flaxman in 1783 in Badger, Shropshire, England. Flaxman was well known by a lot of people for making memorials for people that made the figures look tender and innocent, so he had a lot of work making those. We just learned how to Count to ten in Greek. The Greek alphabet has some letters that look a lot like the English alphabet, but other's don't. Like the letter a (alpha) looks kind of like the letter a, and the letter b (beta) looks like the letter b. The word "alphabet" even comes from the greek letters alpha and beta! Just like English, some of the upper and lower case letters look different. Α, α (alpha) - Sounds like "ah"
Β, β (beta) - Sounds like the letter "b"
Γ, γ (gamma) - sounds like the letter "g"
Δ, δ (delta) - Sounds like the letter "d"
Ε, ε (epsilon) - Sounds like "ay"
Ζ, ζ (zeta) - Sounds like the letter "z"
Η, η (eta) - Sounds like "ee" or "eh"
Θ, θ (theta) - Sounds like "th"
Ι, ι (iota) - Sounds like "ee"
Κ, κ (kappa) - Sounds like the letter "k"
Λ, λ (lambda) - Sounds like the letter "l"
Μ, μ (mu) - Sounds like the letter "m"
Ν, ν (nu) - Sounds like the letter "n"
Ξ, ξ (xi) - Sounds like "ks"
Ο, ο (omicron) - Sounds like "oh"
Π, π (pi) - Sounds like the letter "p"
Ρ, ρ (rho) - Sounds like the letter "r"
Σ, σ/ς (sigma) - Sounds like the letter "s"
Τ, τ (tau) - Sounds like the letter "t"
Υ, υ (upsilon) - Sounds like "oo" or "ee"
Φ, φ (phi) - Sounds like "ph"
Χ, χ (chi) - Sounds like "kh"
Ψ, ψ (psi) - Sounds like "ps"
Ω, ω (omega) - Sounds like "oh"
ASL alphabet: A, B, C, D, E, F, G, H, I, J, K, L, M, N, O, P, Q, R, S, T, U, V, W, X, Y, Z The Italian alphabet looks the same as the English alphabet. We just learned about the Slow Earthquake. Sometimes earthquakes happen underwater, deep down at the bottom of the ocean floor. When this happens, it is called a Submarine Earthquake. The tectonic plates that cover the earth are also at the bottom of the ocean. When they move and bump into each other, it causes a submarine earthquake. This causes big waves to happen in the ocean, and can sometimes turn into a gigantic wave called a tsunami, which can cause flooding on cities that are right on the ocean. Some of the places where these tectonic plates hit are in the very deep parts of the ocean, called "trenches". We just learned about the Masked Tree Frog that looks like it is wearing a mask. When frogs are babies, they are born in eggs, like a chicken. Their eggs are in water, and are usually clear and covered in a kind of jelly. Baby frog eggs are called Frogspawn. Some frogs lay their eggs in long strings, some lay them into soft dirt, and some lay their eggs in foam. Other frogs lay their eggs in trees and then drop into the water. The eggs usually hatch after about a week. We just learned about the Scapula & Clavicle Ligaments. Another group of ligaments are the Glenohumeral Ligaments that connect the humerus (upper arm bone) to the scapula (shoulder blade or wing bone), and helps hold the shoulder in place. The scapula has a part sticking out called the coracoid process that helps it get tied to the other bones, and it has a part called the glenoid cavity which is like a rounded holder where the shoulder bone goes to help hold it in place. We just learned about the Mexico state of Sinaloa where some people still play the Mesoamerican ballgame. 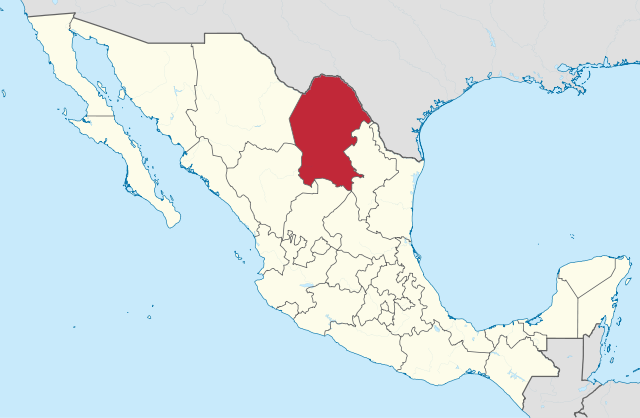 Another Mexico state is Coahuila, which is on the north east part of Mexico, bordering the US state of Texas, along the Rio Grande river. There are many trees in the bottom and top left of the coat of arms, for the many trees that are found in the state. The bottom part has the Monclova river that runs through the state, and the rising sun which is for the Mexican Revolution. The top right has a lion and a column with the words Plus Ultra, which means Further Beyond. The top left has two wolves by a tree. The animals in these top two crests come from the people of Spain that came to Mexico. 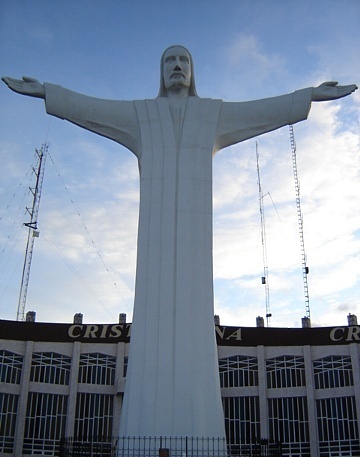 In the city of Torreón, there is a statue of Jesus called Cristo de las Noas. It is the largest statue of Jesus in North America, and is over 70 feet tall. The name of the city comes from the towers that were built to monitor the floods. Underneath the city is a canal called "Canal de la Perla" which means the Pearl Watercourse, that was made to help bring the river water to the fields long ago. It is not used anymore so they have opened it up like a museum that people can walk through. We just learned a little about Nuns. We learned a while back about the Desert Fathers. There were also Desert Mothers who were women living in the desert either as hermits or in small groups with other women. We just learned about the Columbus Doors by Randolph Rogers in 1855, in Washington D.C. at the US Capitol. One of the most famous neoclassical sculptors of all time was Antonio Canova. He was born in northern Italy, and traveled to Venice and Rome, and studied Michelangelo's works. In his lifetime many people thought he was the best artist in Europe, and he made sculptures for France, England, Russia, Poland, Australia, Holland and even America. He did sculptures of famous people like Napoleon and George Washington, and even designed and built his own church in Possagno, the town where he was born. In 1820 he made a sculpture of George Washington while he was living in Rome, and had it sent over the Atlantic to North Carolina. We learned in Greek that 1-5 is ένα, δύο, τρία, τέσσερα, πέντε. Now let's count up to ten! Do you remember how to say it in other languages? We just learned about the Remotely Triggered Earthquakes. Another type of earthquake is the Slow Earthquake. The earthquakes that we see in movies or see on TV are usually a fast earthquake that is over in just a few seconds or minutes. Scientists have now found out that sometimes there are earthquakes that last for hours, days or even months! These are called Slow Earthquakes, and they are very quiet or maybe not even noticed except by some special scientific tools used to measure earthquakes. We just learned about the Yellow Spotted Climbing Toad, the only toad that lives in the trees. Another type of frog is the Masked Tree Frog, also called the New Granada cross-banded tree frog, or Smilisca phaeota. They live mostly in Middle and South America, in tropical forests. They get the nickname of masked tree frog because they look like they have a black mask on. The black mask covers their eyes, which helps them hide from predators. We just learned about the Sternoclavicular Ligaments that connect your clavicle to your ribs and sternum. We learned long ago that the clavicle (collarbone) and scapula (shoulder blade or wing bone) work together to hold the ribs and shoulders. Another group of ligaments are the ones connecting the Scapula & Clavicle. They are connected with a few different ligaments, at different parts of the bones. 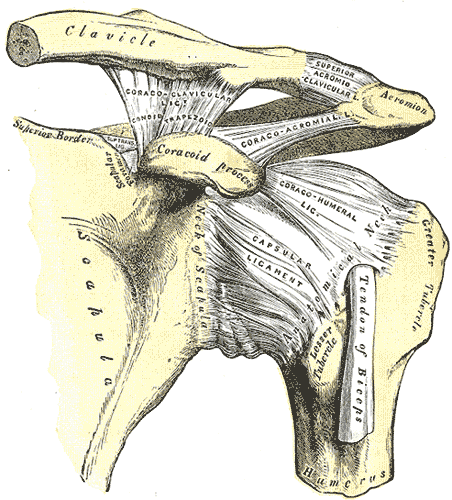 The coracoid process and acromion are two parts of the scapula that stick out and hang on to ligaments that are tied to the clavicle. We just learned about the Mexico state Baja California on the northwest part of Mexico. Another Mexico State is Sinaloa. This state borders the Gulf of California, which is a gulf on the west part of Mexico, and it also borders the Pacific Ocean. The coat of arms of Sinaloa has four parts, for the four main cities in the state. The top left is an Aztec picture for the city of Culiacán, the capital of the state, showing the bended mountain Colhuacan. The top right is a fortress for the city of El Fuerte. The bottom right is an anchor and deer's head for the city of Mazatlán, which is the place of the deer. The bottom left is a torn rosary with a broken chain, for the city of El Rosario. The oldest sport in the world to use a rubber ball is the Mesoamerican ballgame, where people would play on a court and hit a rubber ball around. In Sinaloa they still play a type of game like that one, called ulama, where people have to hit the ball with their hips to keep it moving on the court. There are many large rivers that go through the state. The three largest are the Culiacán, Fuerte, and Sinaloa. On the coast of Mazatlan are many beautiful rock formations to see from the ocean. We've learned a lot about monks now, from famous monks to how and where they lived for hudnreds of years. Monks through history were only men, but when women lived the same kind of life, they were called Nuns. Many people believe the name Nun came from the word for grandmother "Nonna". Just like Monks, Nuns usually live away from other people, only living with other Nuns. We just learned about the Character Heads by Dutch artist Mathieu Kessels. Another neoclassical art sculpture is the Columbus Doors by Randolph Rogers in 1855, in Washington D.C. These bronze doors are on the east part of the US Capitol Building, and they show the life of Christopher Columbus. There are 16 panels on the doors, with two archways above, telling everything from Columbus before he left for America, to him landing in the new world. Rogers was an American sculptor born in New York, who later moved to Italy to work with other famous sculptors. He made many famous American sculptures like these door and other statues across the country. Let's count to five in Greek!